Map of Daen Seeth circa 2E 582. 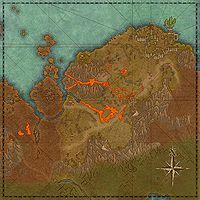 Daen Seeth (or Daen Seth) is a coastal region in east-central Morrowind, within the larger region of Stonefalls. It borders the region of Zabamat to the west, and the region of Bal Foyen to the east. The capital of region is the city of Davon's Watch, which is a House Indoril port city in the Inner Sea. Ash Mountain is one of the two volcanoes located in Stonefalls and it houses one of the Brothers of Strife, Balreth. The town of Senie is located along a foyada near the volcano. The Starved Plains was a battlefield during the time of the Chimer.